An Augustinian convent was founded here in 1250, with work on the convent and the first church finishing in 1292. Brunelleschi was asked to design a new church in 1434, but building did not begin until 1444, two years before his death. 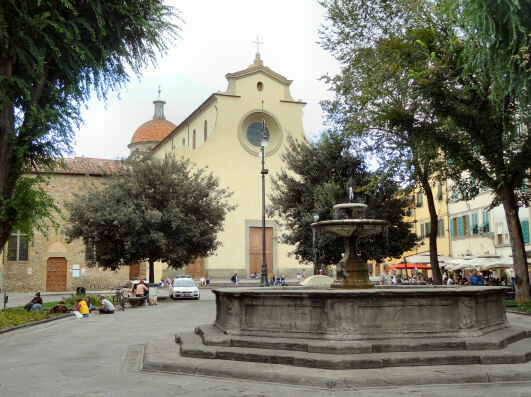 Part of the delay was down to residents refusing to sell their houses to make way for a new piazza facing the Arno, which was part of Brunelleschi's original plan. There was also a disagreement amongst the members of the works committee about the number of doors in the facade. 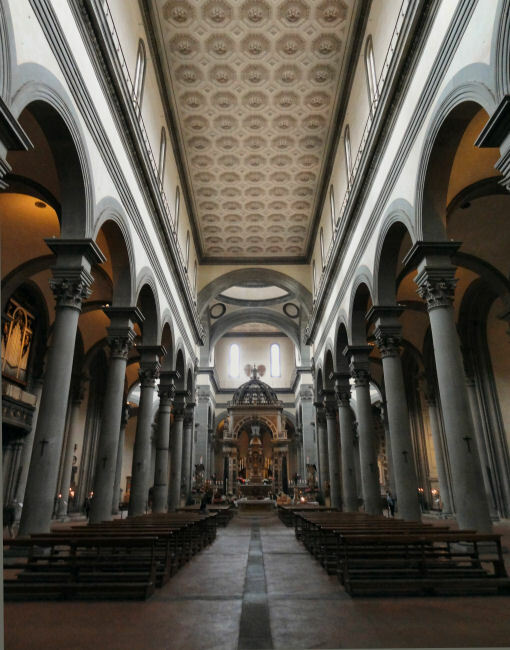 The church was unusual for being almost wholly financed by the Florentine government, a fact supposedly explained by their need to have a controlling influence in an area they suspected could harbour an uprising, the district being dominated by the artisan class. Building continued slowly for most of the 15th century, under the direction of Antonio Manetti and others, but was sped on by a fire which destroyed most the old church, then still in use (see Feast day performances below). 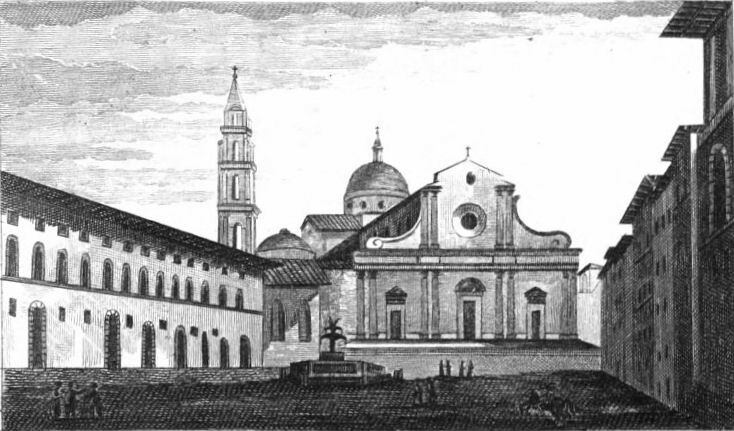 The later work included the dome and inner façade, to designs by Salvi d'Andrea. 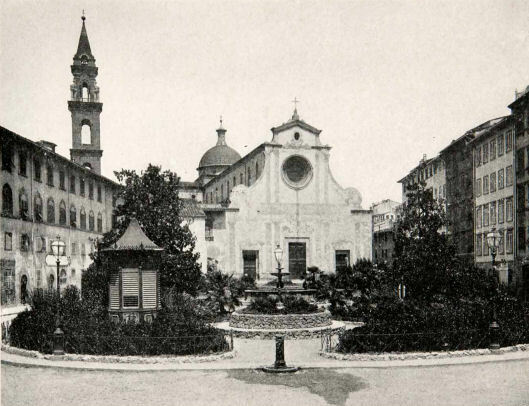 Suppressed by Napoleon in 1808, much of the larger complex is now government offices, with the Augustinians still responsible for the church and its immediate buildings. The façade is from 1792 and was decorated with painted architectural detailing (visible in the print and the old black and white photo see far below) which was removed during late-20th-century restoration work. The coats of arms over the windows down the sides are those of the families whose chapels are on the other side of the windows. Big and serene and very Brunelleschi-ish, if a little spoilt by the later big baldacchino (see photo below right). If you can ignore it this is Brunelleschi at his best - less spoiled and more solemn than San Lorenzo. It's a Latin cross with a dome over the crossing, thankfully left unfrescoed. The chunky columns are reflected by similar pilasters in the aisle walls. The column's capitals, like at San Lorenzo, have blocks above them, called pulvins, from which the arches spring that much higher. There are 39 side chapels, those in the transept show a striking uniformity of size and design, probably due to the friars, or the administrative operai, attempting to impose a degree of control on the chaos and ambitions of private chapels. Uccello is buried here. This church has thirty-eight altars, almost all with painted altarpieces - the best have been cleaned and are almost all in the transept and behind the baldacchino, this being where the most prestigious local families could afford to have chapels. Many also have impressive painted altar frontals, which aren't something you see everyday. Beginning at the entrance, the altarpieces facing each other over the first altar on each side are bright and bearable works by Pier Francesco Foschi, a Resurrection and an Immaculate Conception. (There is also a Transfiguration by him in the right transept.) All were commissioned between commissioned between 1540 and 1545. He was a talented pupil of Andrea del Sarto, better known for his portraits but now little studied. 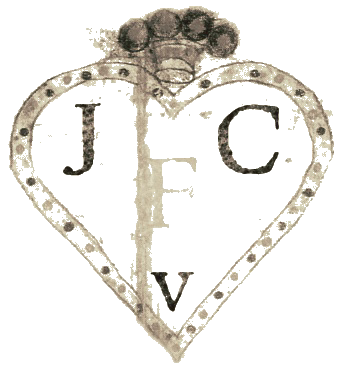 His reputation may have suffered from Vasari ignoring him, which could be down to his being a contemporary and Vasari resenting him for getting commissions he thought he should've won himself. There are unspecial Michelangelo sculpture copies in the next two chapels facing each other across the nave. The next three on the left are 17th century and missable but the third is by Ridolfo del Ghirlandaio and Michele Tosini of the Madonna and Child with Saint Anne and Saints Thomas Aquinas, Peter Martyr, Domenico, Vincent Ferrer, Mary Magdalene and Catherine which has charm, which the next two, after the door, lack. As you turn into the left transept facing you are two admirable altarpieces by Agnolo and Donnino del Mazziere, a Madonna and Child with Angels and Saints Bartholomew and Nicholas and a Trinity with Saints Mary Magdalene and Catherine. The brothers were formerly little known beyond their works here, which includes the altar frontal in the chapel to your left as you face these two, and works by them used to be just ascribed to the Master of Santo Spirito. Above this frontal is a calm Madonna and Child with Saints John the Evangelist, Lawrence, Stephen and Bernard by Raffaellino del Garbo (1505). Next is the impressive sculptural Capella Corbinelli by Sansovino, and then (after a second Corbinelli Chapel, with an altarpiece by Cosimo Rosselli) there's the Saint Monica Altarpiece, long given to Botticini (and the label here still says so) it is now thought by many to be by Verrocchio. It is an unusual composition with a company of striking darkly-robbed nuns. Next along, to your right, is the Ubertini Chapel with another Mazziere brothers altarpiece, a Madonna and Child between Saints John the Evangelist and Bartholomew, which has a Bellini-like serenity and very characterful faces. Amongst the big ones along the back wall the highlights are the middle two, by Allori. On the left is Christ and the Adulteress and on the right, in the Pitti chapel, is the flesh-filled Ten Thousand Martyrs of Ararat. The predella features a view of the Palazzo Pitti before it was enlarged with Luca Pitti, who commissioned the altarpiece, standing outside in a red hat. The earliest painting in the church is the 14th-century polyptych lacking a frame facing you to the right, a Madonna and Child with Saints Mary Magdalene, Andrew, Julian and Catherine by Maso di Banco, a follower of Giotto. It was placed here in 1480 by the Vettori family, but it had been over their altar in the old church. Turning into the right transept, the second chapel along is the Nerli, containing a glowing Fillippino Lippi Madonna and Child with Saints Martin of Tours and Catherine of Alexandria (The Nerli Altarpiece) (see right) with its slightly drugged-looking Madonna and Jesus playing with the young John the Baptist. The donor Tanai de' Nerli and his wife Nanna are seen being presented by the saints in the foreground. In the background on the right Nerli is seen in a red cloak arriving at his palazzo with the Porta San Frediano visible behind. This altarpiece was restored in 2011-12 for the exhibition Filippino Lippi e Sandro Botticelli at the Quirinale in Rome. Filippino also designed a window for this chapel depicting Saint Martin and the Beggar. It's lost, but a drawing for it is in the Uffizi. 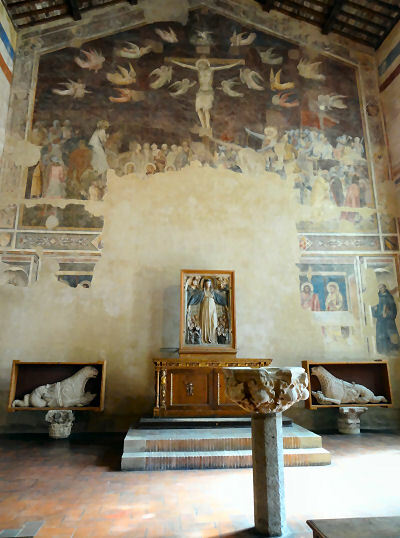 To the left of this chapel is the Nasi chapel, containing a dark but decent copy of Perugino's Vision of St Bernard made by Felice Ficherelli. 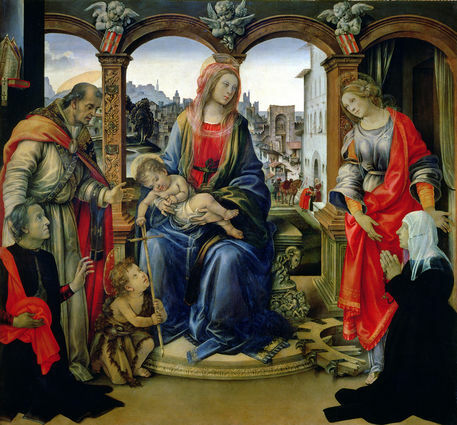 The original is in Munich, as is the Perugino-inspired Lamentation with Saints John the Baptist, John the Evangelist, Mary Magdalene and James, which Raffaellino del Garbo painted for this chapel around 1500 - see Lost art below. The last chapel on the right on this wall is the Velluti Chapel and contains a small painting which seems to show Mary whacking a devil with a stick in a colourful courtyard. It is called the Madonna del Soccorso, and the story is of a mother who threatens her misbehaving child with the devil and is then shocked when he actually appears, but the Madonna appears and saves them. The painter, previously just known as The Master of the Johnson Nativity, has recently been identified as Domenico di Zanobi. The right hand aisle of the nave has a pleasing large and bosky sculptural scene with Tobias and the Angel, but not much else to detain us, the altarpieces being from the 17th and 18th century. Reached through a door in the left aisle, you first enter a vestibule built by Cronaca in 1491, to a design by Giuliano da Sangallo, then enter the pleasing octagonal space of the sacristy, with its built-in cupboards, also designed by Sangallo. It contains a suspiciously lissom Crucifix attributed to Michelangelo, said to have been carved in gratitude for his being allowed to to study corpses here, it was rediscovered here in 1963 and restored in 2000. By Baccio d'Agnolo from 1503. 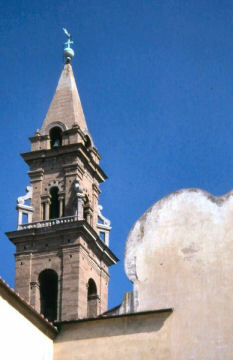 Inaugurated 1571 when a bell donated by Cosimo I was installed. A processional Crucifix said to have been responsible for miracles in the early 15th century was later placed above an altar in the old church here, and then in the de'Rossi chapel of Brunelleschi's new church. Surviving the fire of 1471 increased its reputation. 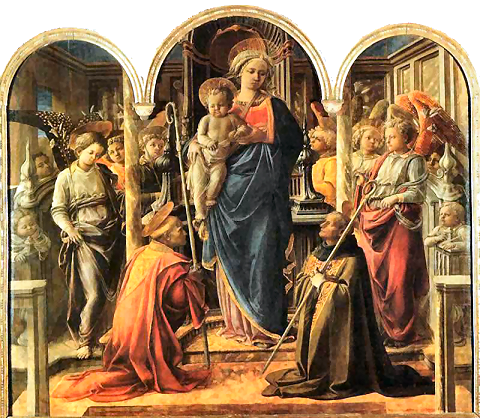 Filippo Lippi's Virgin and Child Surrounded by Angels with Saints Frediano and Augustine (The Barbadori Altarpiece) (see right), is named for Gherardo di Bartolomeo Barbadori, who died childless in 1429 and left money for a chapel at Santo Spirito. The painting, commissioned on 8th March 1437, is today in the Louvre (looking in need of a clean) having been looted by Napoleon in 1810, although the predella was returned and has been at the Uffizi since 1819. This altarpiece has the reputation of being the first to make a single unified space out of the traditional triptych format, with the pillars not quite matching the triptych form serving to further widen the space. But Orcagna's Strozzi Altarpiece of 1354-7 in Santa Maria Novella has a unified space, albeit against a gold background. Lippi himself is said to be the figure resting his chin on the woodwork behind the angel on the left. Christ Carrying the Cross by Biagio d'Antonio, who was early on influenced by Filippo Lippi, here paints plastic faces redolent of Cima. The work was once in the Antinori chapel here and is now in the Louvre. Neri di Bicci's Tobias and the Three Archangels (1471), is now in the Detroit Institute of Arts. Neri's pupil Botticini's altarpiece of the Three Archangels, painted for the chapel of the Compagnia dell'Arcangelo Raffaello, which he had just joined, was also painted in 1471, was previously attributed to Verrrocchio, and is now in the Leonardo Room in the Uffizi. Piero di Cosimo's Visitation with Saints Nicholas and Anthony Abbot of 1489, painted for Gino Capponi, remained here until 1713, when it was replaced by Giovanni Sagrestani’s Marriage of the Virgin. It's now in Washington, where it was restored in 2014. Rosso Fiorentino's Madonna and Child with Ten Saints (The Dei Altarpiece) (1522) was painted for the chapel of the Dei family here. It's now in the Palatine Gallery in the Palazzo Pitti. It was acquired at the end of the 17th Century by Grand Prince Ferdinando, who deprived many Florentine churches of their altarpieces, either by supplying cash or replacement copies. He had this painting expanded on all four sides to fit a new frame, with a broken-wheel attribute added to explain the identity of the sitting female saint. It was painted for Ranieri Dei for the Dei chapel here to replace the unfinished Madonna del Baldacchino by Raphael, now also in the Pitti. The Mass of St Gregory (The Antinori Altarpiece) of 1501 y Raffaellino del Garbo, a pupil of Filippino Lippi, is now in the Ringling Museum in Florida. His Lamentation of c.1500, painted for the Nasi Chapel here, is now in Munich. 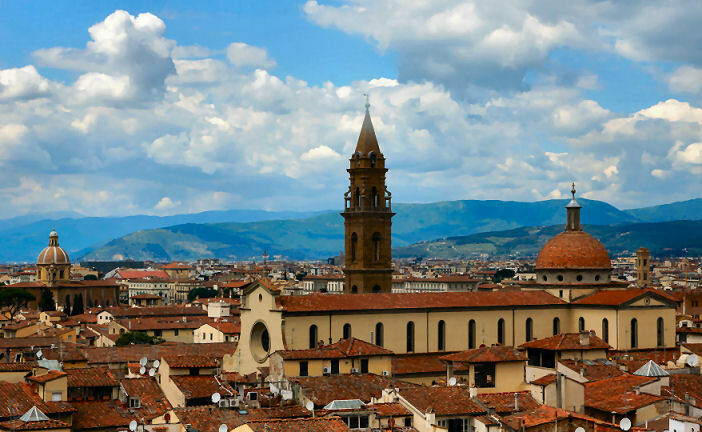 Many churches in Florence were famous for putting on, often spectacular, performances on particular feast days, involving hoists, machinery and fireworks. Here it was was the Ascension , but after the performance of 1471 led to the old church burning down the festa was discontinued. A report from 1428 tells of the use of cannons or fire tubes fixed to the heads of the actors playing the Apostles, so that fire could appear over their heads after the dove of the Holy Ghost appears similarly lighted. It is believed that it is these fire tubes which caused the fire of 1471. Chris Rea, an artiste under the weight of whose CDs my shelves do not sag, released an album in 2011 called Santo Spirito Blues, which included a DVD film that features faux-arty black and white filming of a child being lead around Florence by a priestly silhouette. Dubious. All that survives of the 14th-century complex. There's a dramatic but very ruined fresco of The Crucifixion (over an almost totally ruined Last Supper) by Andrea Orcagna and his studio, which would probably have included his brother Nardo di Cione (see photo right). The space is used to display various old statues and fragments of decorative stonework from the collection of Salvatore Romano. Hence the place is also now known as the Fondazione Salvatore Romano. In a typical rant about the barbarity of modern society, and presumably referring to the Refectory here ...the oratory of the Holy Ghost is used for a tobacco store. In 1980 artist Mario Mariotti invited citizen involvement in a project called Piazza della Patta, involving projections of images onto Santo Spirito's façade. The response resulted in some impressively quirky, monumental and politically-charged images, projected onto the church during nights of music, dance, poetry and theatre. For more see here. You can now save a few euros by buying a combined ticket for the Refectory (aka the Fondazione Salvatore Romano) and the Brancacci Chapel, this being available at the Brancacci Chapel.